Two of our top-selling transformer shades, available in a limited edition set! 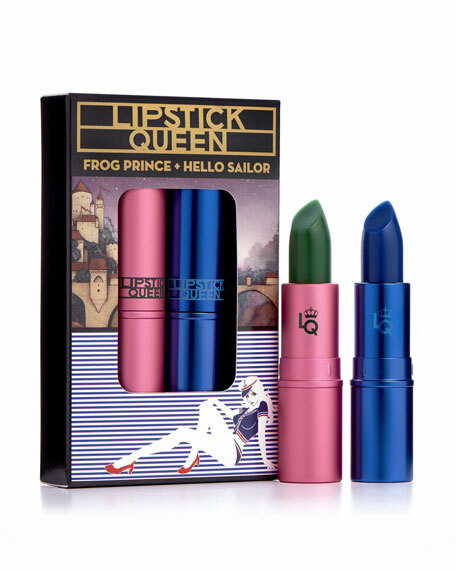 Experience your own fairytale with our bestselling Frog Prince Lipstick. An enchanting emerald green magically transforms into a flattering rosebud pink with a beautiful, glossy sheen. 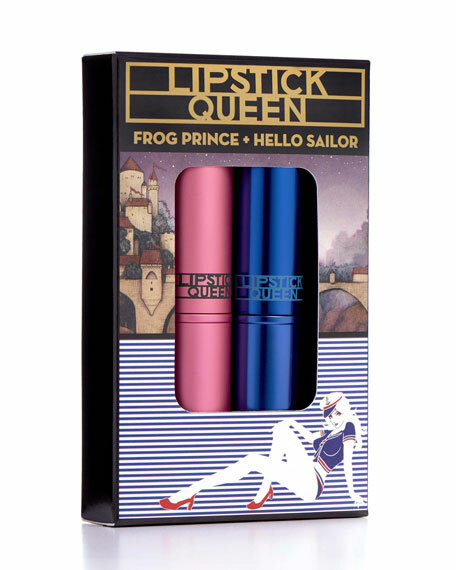 This world-renowned lipstick uses Lipstick Queen's famous pH-reacting technology, which instantly morphs into your own unique shade, working in perfect harmony with your complexion. Enriched with Vitamin E and Shea Butter, this luscious, petal-soft, semisheer lipstick leaves lips feeling smooth and silky while noticeably soft and hydrated. Happily-ever-after is yours with this easy-to-wear, every day, perfect pink. Make waves with Hello Sailor, the head-turning, nautical blue that transforms into an ultra-modern and flattering sheer blueberry mauve. Using Lipstick Queen's famous color-changing technology, this formula reacts with your pH to instantly change into your own unique shade, that complements any skin tone. Enriched with Vitamin-E and Shea Butter, this must-have lip color glides on silky smooth and leaves lips soft, supple, and moisturized. The cool berry tone and hints of deep sapphire make teeth appear whiter, and illuminates your complexion for the complete naughty-cool look.